Somewhat interested in playing the guitar, one day I asked a sister how she learned to play. Did she have formal lessons in the Seminary? Was she in a band before coming to the Community and picked it up from a friend? Did she use a book and study music theory or learn it by ear? She replied, "I learned from the Marguerite Naseau School of Music." I was puzzled. 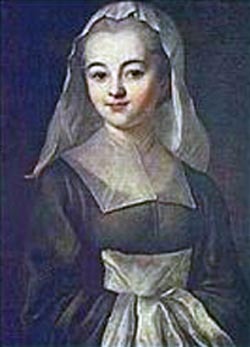 I knew Marguerite Naseau, that she was the first Daughter of Charity, and that she died before the Little Company officially existed. I was aware that St. Vincent referred to her as the "ideal Daughter of Charity," emphasizing her modest country upbringing as a "true village girl" and her genuine living of the virtues of humility, simplicity, and charity. But a school of music? That didn't seem to fit. The sister went on to explain: "I learned to play the guitar like Marguerite learned to read. I asked different people how to play a chord here and there and, eventually, I could put the chords together to play a song." St. Vincent comments on this method of learning in his July 1643 conference on "The Virtues of Marguerite Naseau." "Moved by a powerful inspiration from heaven, the idea came to [Marguerite Naseau] to teach young people, so she bought a primer and, since she was unable to go to a school for instruction, went and asked the pastor or the assistant to tell her the first four letters of the alphabet. On another occasion, she asked about the next four and so on for the rest. Afterward, while minding the cows, she would study her lesson. If she saw a passerby who looked like he knew how to read, she would ask, 'Monsieur, how is this word pronounced?' In this way, she gradually learned to read, then taught other girls in her village" (Coste Vol. IX, #12, pg. 65). Marguerite gradually learned to read...Sister eventually could play a song. This village girl school of learning seems to take time and requires a lot of patience. It also demands trust that the right person will come along to pronounce a new word for you or to teach you a new chord. What strikes me the most about this method is the humility is takes to acknowledge your dependence on others and the simplicity it requires to invite someone to share their knowledge or experience with you. Sometimes, we fool ourselves into thinking that we can figure out all of the answers if we spend enough time "Googling," or we can learn how to do anything by watching a few YouTube videos. Asking Siri is not the same as asking a living, breathing person standing right next to you. Perhaps we can gain some knowledge...but what about wisdom? St. Vincent wrote, "Wisdom consists in following Providence step by step" (Coste Vol. II, #720, pg. 521). Divine Providence is manifested through our daily encounters with the people, events, and circumstances of our lives. May we view the limits of our own knowledge not as limitations, but rather as opportunities to meet grace, following the Little Way of Marguerite Naseau...one letter at a time, one chord at a time, one step at a time. Written by Sister Kara Davis, D.C.